Congratulations to tour winner Michelle P. and to host winner Mixed Book Blog. 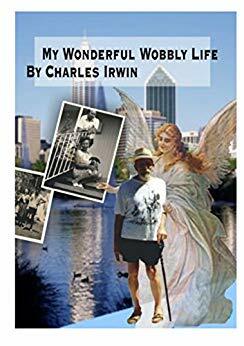 Goddess Fish Promotions is organizing a Virtual Book Tour for My Wonderful Wobbly Life by Charles Irwin, a Autobiography/Memoir available now from Bookbaby Publishing. The tour will run August 7, 2018 to November 15, 2018. Prewritten guest blogs and interviews, along with promo posts, and reviews are available. Please specify which type of stop you’d like when you ask to host this tour. The book is available in PDF format for review. This is the story of the different obstacles a disabled man was confronted with as he made his way in life. How he accepted and overcame them. Beginning his life with not being able to walk more than a few steps before falling over, becoming a boy scout and gradually being able to walk several miles with a pack on his back. Being directed to attend a special school for handicapped children, with a low academic level. Furthering his education at evening classes to become a Chartered Engineer, academically equivalent to a B.Sc. Starting his working life as cheap labour as an office boy and factory hand, to earning a professional’s salary. Charles' passion for helping people is shown by his activities as a Scout, a Rotarian and Freemason. As a child he was taken to a Spiritualist church, for 'faith healing', he became interested in spiritualism and healing. His curiosity was aroused, and he explored many alternative healing practices. Then as well as using spiritual 'laying on of hands' energy to heal with, he studied to become a hypnotherapist. Lessons he learned from the events recalled in each chapter are shared with the reader. A Jack of many trades and master of several. ‘Manufacturer of glass fibre products’ : ‘Laboratory technician – developing machine tool improvements – use of Dung beetles to control bush flies’ : ‘Tool-maker’ : ‘Spray-painter’ : ‘Patent examiner’ : ‘Art gallery curator’ : ‘Personal counsellor’ : ‘Tarot reader’ : ‘Masseur’. This story gives insight into many activities that an able-bodied man would have liked to experience. An inspirational tome.